The Russian Orthodox church celebrates Christmas on January 7 in line with the Julian calendar. Russian Orthodox believers flocked to churches on 7th of January to attend Christmas service. At least 14,000 people attended Christmas service in Moscow alone, a police spokesman said. "So far, about 14,000 people attended the capital's churches, and they continue to arrive. No incidents were reported," Viktor Biryukov said. 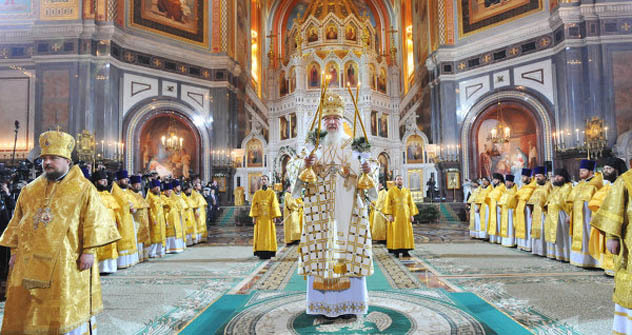 The head of the Russian Orthodox Church, Patriarch Kirill, called on the believers to pray about "our Fatherland, our Church and our people" during the Christmas service he conducted at the Cathedral of Christ the Savior. He also called on the Russian people to show unity in his Christmas address. "The importance of joining forces to overcome sorrow and misfortune was demonstrated by the last year's wildfires and draught across Russia. But people's unity should not be limited only by times of trouble. It should become an indispensable part of our national identity and life," Patriarch Kirill said in a statement, published on his website. Russian President Dmitry Medvedev attended the Divine Liturgy at the Cathedral of Christ the Savior along with his wife and exchanged Christmas gifts with the Patriarch. "The Christmas brings us to the timeless values of love and kindness," the president said. "They have been serving through centuries to strengthen moral values and unity of Russian people," Medvedev added. "And at all times, they helped Russia to pass any test, save our land peace and harmony," he continued. "These values and in the modern days are a foundation for our society for peaceful and constructive life and further development of Russia," Medvedev said. "Let Christmas give everyone confidence, give joy and hope," the president wished. Medvedev also sent a Christmas greeting to the nation via his Twitter account. Russian Prime Minister Vladimir Putin attended Christmas service in the Central Russian village of Turginovo north of Moscow, in the Tver Region where his parents came from. Christmas services will continue until Friday evening, and Church leaders will deliver their congratulations after the Great Vespers, to begin at 16:00 Moscow time. The Russian, Jerusalem, Serbian and Georgian Orthodox churches, Athos monasteries, some Catholics and some Protestants celebrate Christmas on January 7 in line with the Julian calendar, while Roman Catholics, Lutherans, Anglicans and some Orthodox churches celebrate the feast on December 25.